Still catching up on my posts after coming back from Vacation. This post is just a “show off” or “tool gloat” post. Shown in the picture from the Top Left. 2 different width paring chisels- these are not as common as they used to be, and these look nice. 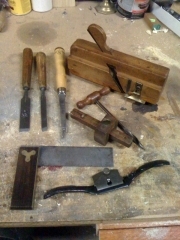 I learned to use them at the Woodwrights Shop and I wanted a couple for myself. Mortise Chisel – looks like a buck brothers handle on a different bland blade. The tip was extremely hollow ground, like on an 8″ grinder wheel, I’ll need to fix that up, but for the price ($12) it was worth trying to fix. Moving Fillister Plane – This was my big score, and made the drive worth it. I paid $27, and I should have bought both they had. I set it up and tried it out this weekend, and it worked great after a quick sharpen. I love this tool, Roy was right. Gimlet – I got it for cheap with the Fillister plane, and I’ll try it out later. Mortising Gauge – I needed one after taking Roy’s Mortise and Tenon class, and this one was $7 (but he took $5) and needs a little TLC, but is in good enough shape to use. Try Square – I used on like this at Roy’s class, and wanted my own. I only had flat contractor squares in the shop. Stanley Spokeshave – I need a good spokeshave for my bowsaw project, and this looks workable. The two I picked up for cheap at Harbor Freight are worthless (big surprise) and I need one that is built better.